The Democratic People’s Republic of Korea, abbreviated as DPRK, and commonly referred to as North Korea, is a country in East Asia, located in the northern half of the Korean Peninsula. 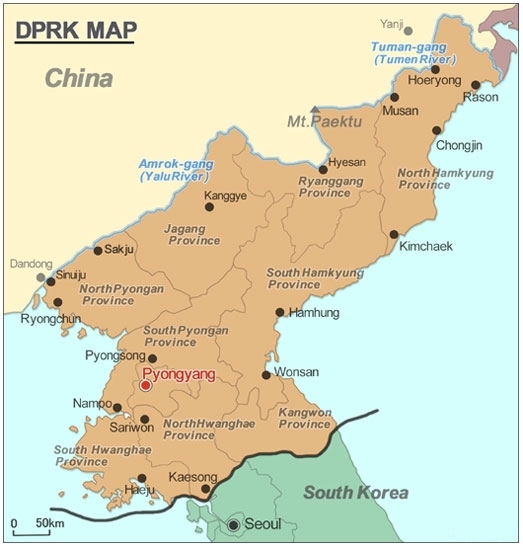 Its capital is Pyongyang, the country’s largest city by both land area and population. The Amrok River and the Tumen River together form the international border between North Korea and the People’s Republic of China. A small section of the Tumen River is also located along the border between North Korea and the Russian Federation, technically following the river’s thalweg. The Korean Demilitarized Zone serves as the boundary between North Korea and South Korea. Prior to 2010, tourists holding United States passports were not granted visas, except during the Arirang Festival Mass Games (아리랑 축제), or with special permission. However, US Citizens are now welcome to visit at any time of the year. Citizens of South Korea require special permission from both governments to enter North Korea, and are not granted such permission for regular tourism at this time. Foreign nationals residing in South Korea are also welcomed to visit the DPRK including US and Japanese. Only Malaysians are allowed to enter North Korea without a visa. As of January 2012, tourists are now able to bring their own mobile phones, laptops, e-readers and tablets into the DPRK, although without a North Korean sim the phone will not be able to make or receive calls. Previously, foreigners had to surrender their phones at the border (or airport) before entering the country. In November 2012, Young Pioneer Tours were the first western foreigners to cross the Tumen border from China into the North East of the DPRK to enter North Hamgyong province where Chongjin is the capital. Due to an increase of foreign interest earlier in 2014, the border between North Hamgyong (North East tours) and Rason, the special economic zone of the DPRK opened up and now allows tourists to cross into each other giving foreigners more of an experience in the far north east! On July the 3rd, Young Pioneer Tours was the first to announce alongside with Reuters that Air Koryo will be reopening weekly domestic flights between Pyongyang, Orang (Chongjin) and Sinuiju. Prior to this, tourists and tour companies were required to charter Air Koryo flights. With the new weekly domestic flight schedule, this has made travelling to the far parts of the DPRK convenient and cheaper. North Korea shares the Korean language with South Korea. There are dialect differences within both Koreas, but the border between North and South does not represent a major linguistic boundary. According to the CIA World Factbook, North Korea’s life expectancy was 63.8 years in 2009, a figure roughly equivalent to that of Pakistan and Burma and slightly lower than Russia. This sleepy coastal town is a YPT favourite, especially in the summer. It has a very different feel to it than Pyongyang and if the season is right you can mingle with locals at the beach or walk out on the pier in the evening and try some BBQ seafood just like the locals do! Wonsan also has some interesting sites such as the international Schoolchildren’s camp, a co-operative farm and more. The DPRK’s second city and primarily and Industrial city, it was only opened to tourists in 2010. The current itinerary for the city is a little limited but hopefully will grow with time. The Hamhung fertilizer factory and central square are the main attractions for now, as is the Majon Beach resort and the chance to visit a place that very few outsiders have ever seen. Hamhung can also be tied in with visits to Wonsan quite easily. The famous “Diamond” Mountains are well known in both Korea’s and to any foreigners with an interest in Peninsular events. Formerly developed by Hyundai into a tourist resort for South Koreans, certain events led to an end to that relationship and it is now open to other nationalities. Kumgang is for now primarily a spot for beautiful scenic views and hiking but there are plans afoot to introduce a wider range of activities in the region. The hotels are among the best in the country and the nearby Sijung Lake is another worthy stop with the option of a mud bath beauty treatment, or a refreshing swim. This is the ski resort that made headlines around the world and created a lot of debate. The hotel is one of the best in the country though there is an extra charge over standard hotels. Aside from numerous ski runs and good quality equipment for hire the resort also features a swimming pool, a small gym and other facilities. When the ski season is over the resort instead offers some fabulous nature hikes through the mountainous surrounds. Another YPT favourite, this city has become easier to visit in recent years. Once only accessible by charter flight, then from Rason SEZ, it can now be reached either by crossing the Namyang border crossing with China or by domestic flight from Pyongyang on Tuesday. Highlights in this city include the Seaman’s Club, the Electronic Library and the North Hamgyong Province Performance group- a show which has only just opened to foreign tourists and is regarded as one of the top 5 performance groups in the DPRK. (Not to mention the awesome feeling of the extremely curious but welcoming vibe from the crowd, most of whom have never seen a westerner up close before). Comprising the former cities of Sonbong and Rajin and the surrounding areas this zone allows some very unique and impossible elsewhere experiences, such as exchanging hard currency for won at the bank, spending it in local shops and best of all visiting the area’s private market! Other highlights include the Rason Language school where you can chat with the local students, the show at the Emperor Hotel, the top notch massage facility, drinks in the local bar on the central square, visiting the beach in summer or the annual trade fair and much more. You can get here either by crossing the border with China at Wonjong or by flying to Orang from Pyongyang then traveling overland. Considered the legendary birthplace of the Korean people this mountain also has loads of recent revolutionary history as well as it’s breathtaking views of Lake Chonji. Due to weather, Mt. Paektu can only really be visited from Late July to Mid September and flights are only available on Wednesdays, but if you can make it fit with your tour it’s well worth seeing! Another famous scenic area this mountain can also be reached by Namyang, or Wonjong land borders or by flight from Pyongyang to Orang. Currently halfway through it’s development plan there is still much to see and do here including the only homestay village in the DPRK. Learn to make traditional Korean dishes, play volleyball, learn Ssirum (Korean wrestling) and have a bonfire beach party with the locals! Visitors can also enjoy some fantastic hikes and scenery, take a swim, go boating or even scuba dive (You will need to bring the equipment however for this). Opened by YPT to tourists for the first time in 2011 along with the Tumen-Namyang border bridge this city is one of the least visited that are open to Western tourists to date. Highlights in this city include the Kim Ki Song Middle school where you can visit an english class as well as numerous other classrooms, the birthplace of General Kim Jong Il’s Mother Kim Jong Suk, the excellent meals and the Hoeryong hotel where the waitresses are happy to join the guests for a very Korean style party, with much singing, dancing and drinking. A convenient place to stop when returning from Mt. Chilbo this county is also famous for it’s natural mineral springs and has many local bathhouses which you can visit for a soak. The seafood dinner at the hotel is also excellent and usually you can take a very interesting street walk (with your local guides of course) in the morning before carrying on to Chongjin or Hoeryong. Only 40 minutes from Pyongyang this city is a great addition to a tour. The itinerary is relatively limited but shows a cross section of different aspects of DPRK life and history. Opened in 2012 you can currently visit the war time location of the Kim Il Sung University, walk around the central square, visit the Anguk Temple, the Paeksonri Foodstuffs factory and the very popular Kim Jong Suk Middle school where you can do an impromptu lesson, a quick Q and A with the English class or just watch a lesson and tour the school facilities, it’s also possible to visit some historical sites in the area and we hope soon more places will open up. Opened in 2013 this city has long been well known due to it’s position directly across the Chinese border from Dandong. It’s the first stop for the international train and previously most westerners couldn’t hope to see much more than the train station. Now it’s possible to do one day trips from China or overnight visits on the way out of Pyongyang by train. Be one of the first to visit the Central square, Revolutionary Museum, Folklore Street, one of the most famous kindergarten performances in the DPRK at Ponbu kindergarten as well as Mosaic artworks of the leaders and scenic spots in the most recently opened DPRK city. Mt Myohyang has three main claims to fame It’s a large nature reserve with some beautiful hikes and scenic views, it has the nearby Ryongmun cavern famed for it’s enormous size and curious rock formations and of course for the International Friendship Exhibition. These facilities store gifts given to the leaders from various persons, organisations and countries around the world and there are some very interesting gifts on display. Another rarely visited part of the country, but one that is open for tourists is Anju. There isn’t much to see and do apart from enjoy the feeling of being well off the usual track. The hotel here has seen better days and the sites in the area are mostly historical. If the season is right and you have a small vehicle it can be possible to visit the Taegak Youth Dam, but the road is not in great condition so often can be impassable. Songnam cavern nearby is a place of interest but is generally surpassed by the more conveniently reached Ryongmun cavern anyway. Not really recommended except for multiple returners. Of course extensions in the capital are also possible but with so many places available for tourists it’s best to get in touch with us and let us know what you’d like to see and we can help put something together for you. This well known Port city is the largest on the West Coast and is directly administered rather than being under the provincial government. Highlights in Nampho and the surrounding area include the West Sea Barrage, the Chongsanri C-operative farm, Chollima Steel Works, and the local spa resort with private mineral baths in bungalow accommodation. For the brave you can also try a West coast specialty- Diesel clams (This is only possible during certain seasons however). There is also a golf course by the nearby Thaesong Reservoir. Another very infrequently visited city partly due to restrictions on Americans staying overnight in the hotel making it complicated for group visits, but also due to being a little out of the way and not having great road links. This city is a little run down despite being the capital of South Hwanghae province. The hotel is located right on the central square of the city but most of the tourist areas are in the surrounding region including the Kangye Stock Farm, Sokdamgugok (A scenic and historical area), Mt Suyang with a waterfall and some ancient remains and Mt Jangsu another scenic mountain area. Sinchon is also near-by and is where the Museum of American War Crimes is located. This city needs little introduction and is famous for being the closest to the border. The main highlight is nearby Panmunjon where you can see the DMZ. The area also largely escaped US bombing as it was held by the South for most of the war so many historical sites remain including the old section of town and the Koryo Museum an ancient museum and UNESCO site. The Pakyon falls are near by and are also famous for the beauty as is the tomb of King Kongmin. Accommodation in the city comes in two options- a traditional Korean style inn in the city where you sleep on the floor (with bedding) Korean style or a modern style hotel that has seen some better days. A convenient stop on the way back from Kaesong there is not much open in this city at this stage. The hotel here also does not allow American guests to stay overnight and the main attraction is the folklore street with a high pavilion offering a fantastic view of the city and drinking Korean Makkoli at the local bar. One thing they don’t lack in the DPRK is mountains! Mt Kuwol is conveniently located after Nampho so can be visited on a loop Nampo- Kuwol-Sariwon-Pyongyang or as a step on the way to Haeju or even Kaesong after Nampo. It features the Woljong Buddhist temple and the famous Tanphung Valley (best visited in Autumn) with beautiful scenic views, ponds and waterfalls as well as historical remains. Also well known in the area is the Jiwon falls.